The Silver Medal is a good, solid table made by the Dynamo brand. The Silver Medal is comparable to the Twister II table made by Dynamo's sister company, Tornado. Though the Silver is not the highest-end of the tables manufactured by Dynamo, it does have many foosball table features we look for when reviewing a table. We like the solid table playfield, wooden handles, and adjustable leg levelers. However, we recommend going with a Tornado table because all tournaments are played on a Tornado and they are the brand you will find more often in bars throughout the United States. 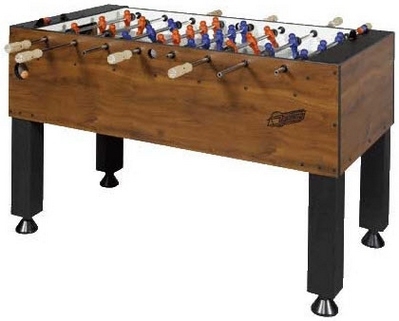 This foosball table is priced at around $750 US. Urethane foosball balls that resist nicks and chips.